This chicken “blood sausage” gets an unusual casing. In the small town of Ubaté, Colombia, hens are valued for more than just their eggs, legs, or breasts; they are also prized for their necks. Stuffed hen’s neck is also known as morcilla de pescuezo relleno because it’s prepared much like morcilla, or blood sausage. After cutting off the head and neck, vendors thoroughly rinse the cavity before stuffing it with potatoes, peas, and rice mixed with the hen’s blood. When cooked over a wood-fueled stove, the neck acquires a slightly smoky flavor while the stretched skin provides the casing in which the rice, vegetables, and blood can stew, melding their flavors. Once the neck becomes golden brown and is no longer supple, it’s ready to be served in crosscut slices, like sausage, or rested on the plate whole, comb to collar. Since the dish is not available in restaurants, the hen-neck hungry must seek out street-side stalls where the cavities are stuffed, stitched, and sizzled with the head and comb still attached. Taste this engorged gullet along with other regional hen-centric specialties, such as sancochos (a stew of hen and vegetables) and whole hens cooked with rich and yolky unlaid eggs inside. 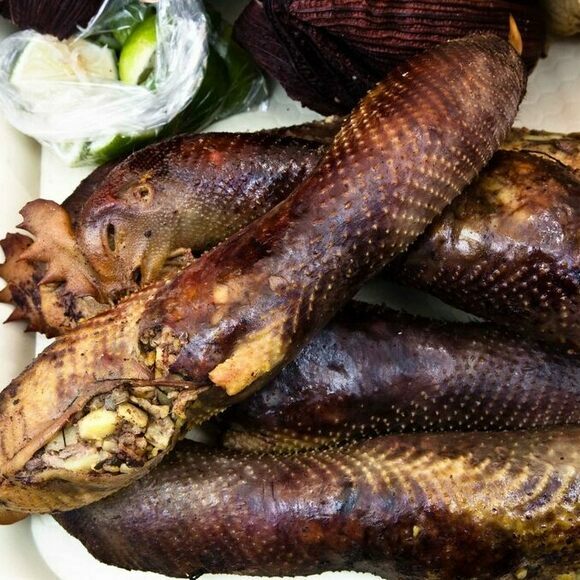 Stuffed hens' necks are also served in the Boyacá region of Colombia. This town square is appropriately nicknamed Plaza de la Gallina. It's surrounded by food stalls where you’ll find regional chicken specialties. In Ubaté, Colombia, hens get cooked with their unlaid eggs inside. Proof that dumplings and chicken wings are not mutually exclusive categories. The Ugandan dish is so delicious, watching it roast is its own show.